The Orion Data Network provides real time data on your shipping containers, beer kegs and other containers delivered straight to your mobile device or email, so you can prevent loss and theft, protect your cargo and maximise the life of your containers. Orion enables you to monitor, track and recover your containers throughout your entire domestic or global supply chain. With Brexit causing uncertainty about exporting and importing, the volatility of the Shipping industry, and globalisation increasing the duration and multi-party complexity of exporting, it has never been more important to have a clear view of assets like containers, that play a huge role in import and export. Asset tracking is a valuable tool at the Container Freight Station, at Inland Container Depots, in any part of a port or marina, in the warehouse, on board ships and at any other point in your supply chain. Accurate information about the whereabouts, status and condition of your containers and their cargo helps you to fulfil regulatory requirements, book transport, arrange the right labour at the right time and enhance your overall customer experience. 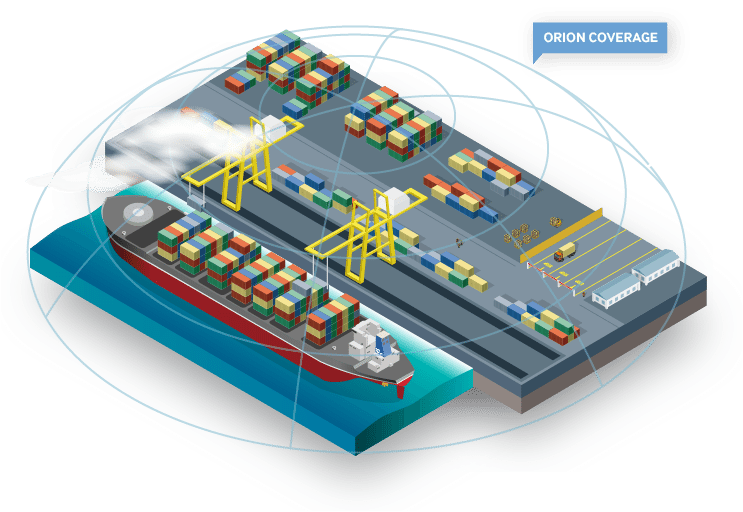 A complete end-to-end tracking, monitoring and recovery system like NFC Group’s Orion Container Tracking Solution extend your asset life, reduces operational costs and time to delivery and results in great cost savings and increased profitability. The import and export market has been a rollercoaster in recent years and Brexit brings even more uncertainty. There are around 43 million containers in the world in service, by sale or leasing; ex-service; and new, ready to go into service. Containers are a hugely valuable collection of assets but are often overlooked when companies are seeking to reduce bottlenecks and maximise efficiency and profits. In times of economic boom, companies tend to over purchase these assets and then lose track of them throughout the supply chain. This means that businesses are re-purchasing items that they actually don’t need if only they could locate and recover them. It also means that maintenance and repairs cannot be properly predicted, which causes unnecessary expense and delays. Containers and their valuable cargo are also at constant risk from theft, interference by arms and migrant smugglers and damage from rough handling. The only way to overcome these challenges is to digitalise the tracking monitoring of the containers to give a full picture of your container usage and enable recovery and supply chain optimisation. NFC Group’s Orion Data Network Container Tracking Solutions allow you to maximise your assets and infrastructure by providing end-to-end visibility and comprehensive data, and predicting patterns, so you can proactively manage their use and maintenance. Over time, tracking and monitoring your Containers will reduce total cost of ownership, increase asset availability and lifetime, improve overall performance and delivery times, lower operational costs and improve your Return on Investment. NFC Group’s Orion Data Network puts you in complete control of your containers wherever they are in the world, with 360 degree visibility and key data analytics fed back to HQ in real time. The Orion Data Network is an award-winning, low-power, long-range digital data network consisting of Orion’s specially designed Gateways & Tags. The system monitors and tracks your containers, which can be tagged separately for comprehensive coverage. Your containers are safe at every stage of their journey as the Gateways listen, and the low cost active RFID tags report every 2 minutes when your containers are stationery and every 30 seconds when they are moving from one location to another during import or export. The tags and IoT enabled sensors relay pre-defined data according to your needs including time, temperature, tamper, speed, latitude, longitude, battery information, shock reports, and relative signal strength indication (RSSI). NFC Group’s Container Tracking Solutions give you real-time end-to-end asset visibility and data to monitor, track and recover your Containers throughout the Shipping Supply Chain. This enables you to manage the flow of asset ownership from Warehouse to Supplier, protecting your assets, your profits and your reputation. You can streamline your repurchasing and predict maintenance and repair schedules. The system allows you to improving your stacking and retrieval processes and reduce the bottleneck caused by heavy congestion and at the container terminals. Orion’s comprehensive data allows you to optimise container collection routes, increase productivity, reduce labour costs and ensure on-time cargo delivery. For truly comprehensive coverage NFC Group has designed 3 types of gateway and 3 types of tag. For convenient plug and play, the Ethernet type gateway interfaces with your existing connection. The mobile gateway runs directly over the Orion network so you have a clear view of your goods in transit by road vehicles, plane, ship or helicopter. The independent satellite option provides an excellent solution for tracking containers in remote locations. These 3 options deliver on the NFC Group promise of total coverage, visibility and control. You can have easy access to your data all the time as reports, alerts and alarms can be programmed to arrive instantaneously on all different types of mobile device, pager and email and integrates with both iOS and android. Tracking devices can be either overt as a deterrent or they can track and monitor covertly. They are lightweight and can weigh as little as 28 grams. They last for 3-5 years on a single charge, and report in real-time with a great range of up to 10 miles from each Gateway. The Orion Data Network can be deployed across the globe quickly, simply and cost-effectively. It is up to 75% more cost-effective than other GSM and CDMA container management solutions. It can start to deliver a return on your investment in just 3 weeks, with up to 20% cost savings made by streamlining your container supply chain operations. As Orion is so innovative and technology is new, it’s best to see it in action. In person, you can instantly understand all of the business benefits it delivers. We offer a free demonstration onsite at your business premises, so call us today on + 44 (0) 1425 485 263 and talk to our experts.